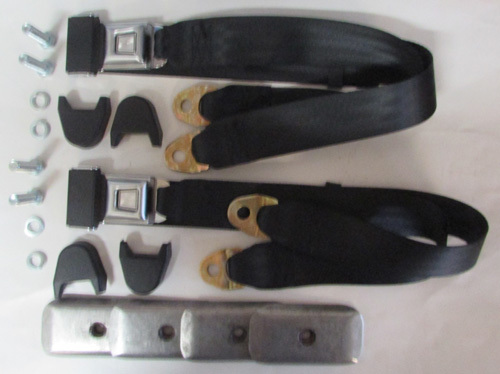 Seat belt mounting hardware kits available for the installation of a retractable lap seat belt and retractable lap seat belt with shoulder harness for bench or bucket seats. A standard mounting kit includes the required bolts, lock washers, nuts, oversize underbody reinforcing washers and the L-bracket needed to mount the retractor upright to install a seat belt for one person/position. A retrofit mounting kit includes underbody reinforcing plates to add support to mounting points which should be used when installing a seat belt in a vehicle that did not have seat belts dealer or factory installed. When using a retrofit mounting kit a standard mounting kit is not required. Includes L-bracket to mount retractor upright. Does not include a L-bracket for buckle side. An additional L-bracket may be required for the buckle side depending on the mounting location. Use kit to mount a retractor and inner buckle side to the floor in an upright position. Includes hardware to attach retractor and buckle side to L-bracket and L-bracket to the floor. Use to mount a retractor or buckle side to the floor in a location where a seat belt was not previously installed. Includes hardware to mount retractor or buckle side to L-bracket and L-bracket to supplied underbody reinforcing plate. One retrofit mounting kit is required per seat belt. 202K For Bench Seat: Includes L-bracket to mount retractor upright. Does not include a L-bracket for buckle side. 202K:An additional L-bracket may be required for the buckle side depending on the mounting location. 204K For Bucket Seat: Includes L-bracket to mount retractor upright and L-bracket for buckle side. 303K For Bench Seat: Includes L-bracket to mount retractor upright. Does not include a L-bracket for buckle side. 303K:An additional L-bracket may be required for the buckle side depending on the mounting location. 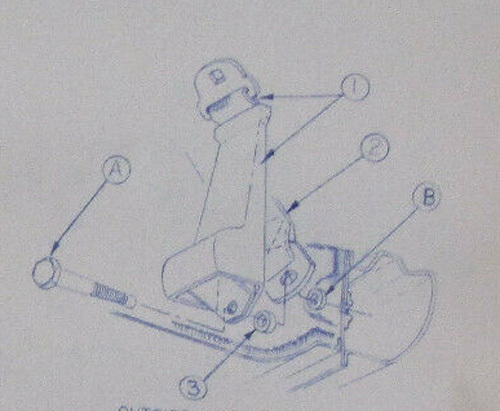 302K For Bucket Seat: Includes L-bracket to mount retractor upright and L-bracket for buckle side.